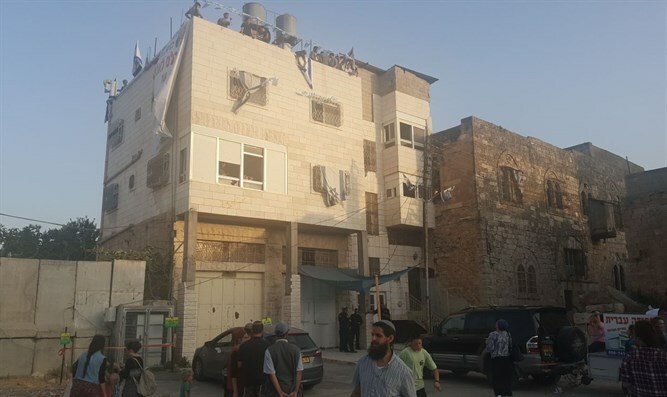 Ministers and MKs congratulate families who entered Machpelah House in Hevron. Ministers and Knesset members from the Likud and the Jewish Home parties on Tuesday congratulated the 15 families who entered the Machpelah House in the city of Hevron, calling on Prime Minister Binyamin Netanyahu and Defense Minister Avigdor Liberman to allow the families to remain in their homes. Environmental Protection Minister Ze'ev Elkin (Likud) said, "I warmly congratulate the 15 families for entering the Machpelah House in Hevron and call upon the Prime Minister and Defense Minister to work to keep them in the house forever." Tourism Minister Yariv Levin (Likud) called on the residents to stay in the area and added, "The scandal in which Jews buy houses legally and are forbidden to enter them should have been stopped long ago. The residents should be permitted to stay in their homes and the discrimination and violation of their rights must be stopped once and for all." MK Miki Zohar (Likud) added, "The land of Israel was built by our forefathers and we must not forget that. The fight for the land of Israel is a stubborn one, and in the end, with God's help, we will perpetuate our hold on the entire land of Israel for ever and ever." Earlier this month, Israeli security forces blocked Jews from entering the Machpelah House and Rachel and Leah House in Hevron, both of which were bought by Jews several years ago. The decision to move into the properties was made in response to UNESCO's decision that the Cave of the Patriarchs is an "endangered Palestinian site" and after the Military Appeals Committee decided to order the Registration Committee to renew the process, abandoned approximately 18 months ago, of registering the property under the name of its Jewish owners.